The winner of the Artisan Notebook Fuss Free Template Challenge is . 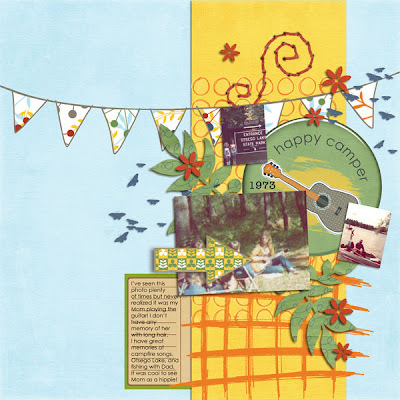 . . MichiganDenise with her layout "Happy Camper." I just love the bright colors combined with those vintage photos (seriously, is 1973 vintage now? Ugh). Anyway, before I begin an extended lament about growing old, I want to say a huge congratulations to Denise. She has won her choice of one of my template packs as well as a three month Guild membership and her layout will be featured in the August issue of The Artisan Notebook. Thanks to everyone who joined in the challenge. I hope you enjoyed the template, and I look forward to see what each of you creates this month! Remember, the July Template Challenge is still open! This is a wonderful layout! Congratulations Denise-we are looking forward to "seeing you" at the Guild!